It really rankles me when non-direct marketers call direct marketing a tactic rather than a strategy. They flat do not understand what the direct marketing discipline is all about. Take the marketing database as an example. Creating a relational database that stores customer, inquirer and prospect records with purchase and contact history represents the foundation of true direct marketing. (In fact, some might say that the customer database represents the true worth of almost any company in existence today). Over time prospects become buyers. With the application of skillful CRM strategies, these buyers become repeat customers. Many of them become lifetime advocates of the company. They refer company products to their friends and circles of influence. This process grows the size and power of the company’s database. This widening and deepening of customers is commonly called database marketing. The banking industry sometimes uses the term database mining. Fund raisers use the donor pyramid illustrating how large bases of small donors gradually upgrade their commitment of money and time to become large donors. 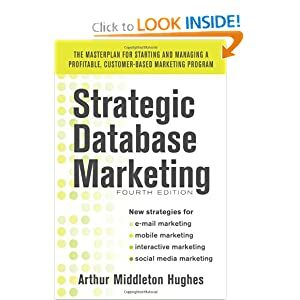 It is clear that the relational database not only represents the foundation of the direct marketing discipline but also qualifies it as a stratgey and not just a tactic. Many organizations are not in a position to test, track responses or gather meaningful marketing intelligence from customer transaction data because they have never set up a relational database. In my view, any company that does not possess a relational database will never leverage the direct marketing strategy to full advantage. But why is it that some companies attempt to set up a database and fail to get a satisfactory return on their database investment? A December 1, 2007 article in Target Marketing magazine written by Kate Debevois summarizing a presentation made by by Arthur Middleton Hughes, vice president and solutions architect for KnowledgeBase Marketing at the DMA07 Conference addresses this very issue. Mr. Hughes suggests five database mistakes companies should watch out for when setting up their relational databases. My comments go well beyond this Target Marketing article. But I will borrow Hughes five points as the platform for this discussion. I believe these same mistakes also provide marketing managers with direction on how to fix their present databases. The usual reaction was dead silence. At that point, the discussions took on a different tone that walked away from pure technology for technology’s sake and focused on the goals. The constant question to ask is what to include in the database based on what you are trying to do. Build “what if” scenarios spelling out what you would do if you had a given piece of information. 2. Focusing on price instead of service. If you think about it carefully, CRM is nothing more than database marketing renamed. Technology now allows more touch points. But direct marketers worth their salt always knew that a company’s wealth depends on the loyalty of their long-term customers. So maintaining a healthy relationship encapsulates the direct marketer’s perspective of the primary function of a relational database. 3. Failing to test against a control. I find it shocking that Hughes felt compelled to mention this step as a requirement. He obviously encountered a number of instances where the database was not used properly. By all means, an essential strategy to ongoing improvement in the direct marketing program is the application of the testing strategy. I cannot tell you how many times I have seen a lift of 25%, 45%, 200% and even more based on testing offers, direct mail formats and various Multichannel combinations. Even seasonality dramatically affects response more than most companies realize or care to admit. 4. Failing to link the database to the Web. This point emphasizes the need to integrate the company in the communications area eliminating silos such as web under IT, advertising under corporate communications, direct marketing under product sales and so forth. Focus on the customer relationship unifying it under one command. 5. Building your database in-house. Hughes believes as I do that building your database in-house is not a good idea. Yes, I realize that KnowledgeBase sets up databases and this comment sounds self-serving. But Hughes is correct in his assessment. Corporate IT departments have no idea about how to set up relational databases. The specifications and business rules exclude them from managing this step. This process requires a direct response focus and a deep understanding of how the database drives the direct marketing program. Make sure the company owns the database and all associated software should the company ever want to go in-house. Don’t let the supplier control your company’s future. Some clients I work with have been badly burned by this proprietary software development issue. Don’t make the same mistake they did. What have you experienced when working with your internal or client databases? What other things should companies watch out for?